WEATHER predicting according to the Hermetic System here set forth is exclusively astrological. Variations in solar radiation as affecting the temperature and consequent weather changes are not considered, nor are sun-spot periods which undoubtedly have much influence upon the weather, nor volcanic eruptions which shut heat from the earth by extensive blankets of dust. The electromagnetic and physical conditions which influence the weather are ignored, and instead the attention is directed exclusively to the manner in which the inner-plane weather tends to change the physical weather from its normal trend during the season at any place selected. The inner-plane weather mapped by astrological positions has an influence on all earthly things and enterprises. In Course XII-I, Evolution of Life, it is pointed out how the inner-plane weather influenced both inorganic and organic evolution. Even though they are not aware it is influencing them, Church of Light research has proved that inanimate objects and other life forms as well as man are powerfully influenced by the inner-plane weather. It is pointed out in Chapter 3 (Serial Lesson 127), “Progress of Invertebrate Life”, Course XII-I, Evolution of Life, that a machine built at one time will not last as long as a machine built at a more favorable time. Many farmers have learned that crops planted at a time when the outer-plane weather seems favorable do not do so well as when planted when the inner-plane weather is favorable. Our research has proved that animals respond to progressed aspects in the same manner as do men, due allowance being made for the evolutionary level of the animal. 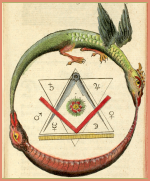 As one illustration in Chapter 3 (Serial Lesson 127), “Progress of Invertebrate Life”, Course XII-I, Evolution of Life, the precise birth chart and the picture of a dog, together with the progressed aspects coincident with fourteen different events in his life are given. If, as demonstrated, the inner-plane weather profoundly influences all other things on earth it would indeed be strange if it did not also profoundly influence the outer-plane weather. That it does do so has been verified by a great many Church of Light and other students who have tested out the system of astrological weather predicting here set forth since its principles were published sixteen years ago. 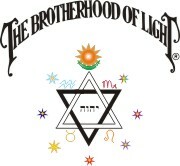 There are seven different branches of astrology, the facts about which so far verified being set forth in seven different Brotherhood of Light courses. There is no implication that we know all there is to know about any branch of astrology. And The Church of Light maintains an active Astrological Research Department which works hard to acquire new and important information about astrology. But relative to each of the seven branches we believe, in addition to considerable detail, we are in possession of knowledge of its fundamental principles. In a broad sense all seven branches of astrology operate on the same general principle, the principle that the inner-plane weather mapped by astrological positions has a profound influence on what happens here below. But in the detail of how knowledge may be gained of just what inner-plane weather is being brought to bear on physical conditions or life forms there is some variation. This branch of astrology is based upon painstaking observation of the parallels which exist between the heavenly positions and worldly affairs. It is the application of this branch of astrology which indicates the relation between astrological factors and spiritual ideas, and the relation between astrological factors and religious or other periodical observances on earth, such as are explained in Course VII, Spiritual Astrology. And it is its function to determine the kind of a chart and the type of progressed aspects used in natal astrology, horary astrology, mundane astrology, stellar diagnosis and weather predicting. Astrological signatures determines the relation between astrological positions and mental and physical conditions and the chart and progressions to use to gain the desired information. This branch of astrology deals with the character of people, groups of people under a single governing authority, enterprises, life forms other than man, and other things which have a definite moment of birth. And with the manner they are apt to react to inner-plane weather subsequent to birth. The principle involved is that a person or other thing is born only at the time when the astrological weather is similar to its inner-plane organization. It is not born at other times because the pressure of the inner-plane weather is too strongly opposed then to its birth. But when the inner-plane weather is similar to its inner-plane organization this pressure opposing birth is no longer present, and a pressure favoring birth is present. This inner-plane organization may represent any variety of evolutionary levels from that of bacteria, protozoa, a fruit fly, or a mammal, to a man of genius. But whatever the evolutionary level, the astrological chart at birth maps the relations of the various inner-plane factors with much consistency. After birth, the life form is influenced by subsequent inner-plane weather. And the astrological factors mapping the energies of the inner-plane weather brought to bear upon the inner-plane organization of the individual are those of major progressions, minor progressions and transit progressions. From observing how people customarily react to inner-plane weather mapped by certain progressed aspects, much can be foretold as to the thoughts, behavior and the events that will enter the individual’s life unless, aware of these progressed aspects, he takes precautionary actions to change what otherwise would happen. Enterprises may be mental as well as physical. Thoughts are inner-plane energies, and may be inner-plane organizations. When some question undergoes formulation in the mind, a mental offspring is in process of gestation. And when the question becomes clear and is expressed verbally or in writing the mental offspring at that moment has its birth. 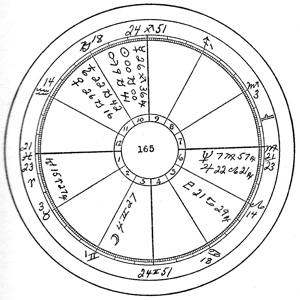 A birth chart erected for the place and the precise moment where the question is given birth will reveal as much about its possibilities, and what will transpire relative to it in the future, as the birth chart of an individual will reveal his possibilities and what is likely to transpire to him in the future. Furthermore, our Research Department has found, through checking a vast number of charts thus erected relative to which events have later transpired, that major, minor and transit progressions work as effectively, and in the same way, with horary charts as they do with natal charts. If the chart as a whole indicates that the question asked about will not take place, no progressed aspect will cause it to happen. But if the chart as a whole indicates the question asked about will take place, the time it will take place is indicated by a progressed aspect which at that time must be within the one effective degree of orb. If the event—or a series of them relative to the question—is a major event, there must at the time it happens be a major progressed aspect involving a planet characteristic of the event and a major progressed aspect involving the ruler of the house which rules the department of life relating to the event. If the event is a minor one, a minor progressed aspect involving a planet characteristic of the event and a minor progressed aspect involving the ruler of the house which governs the department of life relating to the event may be sufficient, although customarily there is a major progressed aspect also indicating it. And if the event is an inconsequential one, a transit progressed aspect involving a planet characteristic of the event and a transit progressed aspect involving the ruler of the house which governs the department of life relating to the event may be sufficient, although customarily there is also either a major or a minor progressed aspect also indicating it. 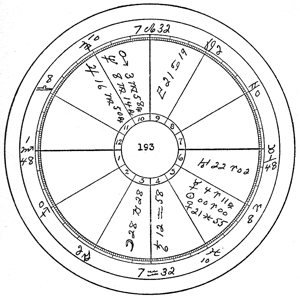 Furthermore, in horary charts, for a major event to happen, the major progressed aspect must be reinforced by a minor progressed aspect and released by a transit progressed aspect, and for a minor event to happen, the minor progressed aspect must be released by a transit progressed aspect precisely as in natal astrology. The astrological factors indicating what will happen and when, relative to a mental birth are closely similar to those indicating what will happen and when, to that which is physically born. This is a specialized section of natal astrology. The birth- chart constants and the progressed constants for 160 different diseases are given in Course XVI, Stellar Healing. The birth-chart constants indicate toward what diseases the individual is predisposed. The progressed constants indicate those periods of the life when, due to the progressed aspects that will be present, there will be likelihood that a disease toward which there is a predisposition will develop. The indicated disease will not develop unless the progressed aspects are present which are the constants of the disease. These constants not only indicate that precautionary actions should be taken against certain diseases, and that special precautionary actions should be taken during those periods when the progressed constants make it possible for a disease toward which there is a predisposition to develop, but they also indicate the nature of the precautionary actions that should be taken. This is the science of the influence of the heavenly bodies as they affect the world, nations, cities, communities and other groups of people. Any organization of individuals functioning under a common governing authority constitutes an entity. As such it attracts to itself fortunate and unfortunate events in a manner quite similar to that in which like events are attracted into the life of man. Both have birth charts which if known correctly map their characters; and both are influenced by picking up, radio fashion, inner-plane vibrations through changes in their finer structures which are mapped by progressed aspects. When the birth chart of a nation, city or other group is known, the influence of the inner-plane weather on it, and its probable response to the inner-plane weather in thought, behavior and the events which come into its life, are handled in the manner charts and progressed aspects are handled in natal astrology, horary astrology and stellar diagnosis. But supplementing such knowledge, and giving quite a clear picture of the inner-plane weather affecting such groups, are cycle charts erected for the headquarters of the group, or the capital of the nation, at the precise moment a planet moves from south to north declination, or in the case of the Moon, at the moment of its conjunction with the Sun, using the Local Mean Time at the indicated place. This is the birth chart of the cycle of the planet involved, and indicates the fortune of affairs under the rulership of, or influenced by, the particular planet. Such cycle charts used in Mundane astrology also are progressed. But the only planet thus progressed is the planet for which the cycle chart was erected. This planet is progressed only by its transit movement as shown in the ephemeris for that calendar period. The aspects this planet makes with the positions of the planets in its cycle birth chart indicate when each event indicated by the cycle birth chart will happen. Birth charts are not erected in spiritual astrology. 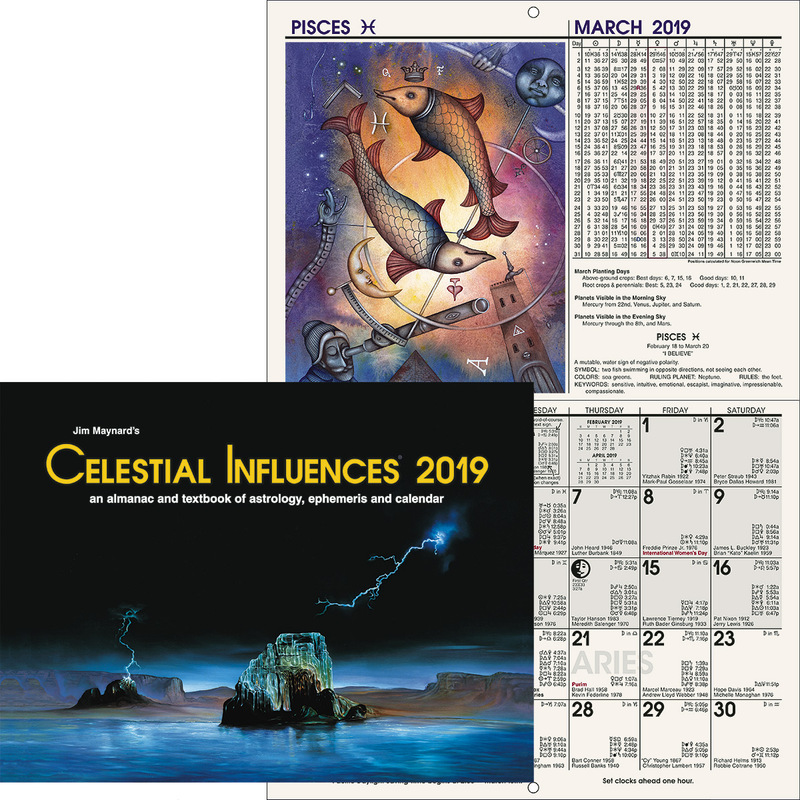 Spiritual astrology relates to the pressure of astrological influences as affecting the moral conceptions of groups of people, and the pressure exerted by astrological energies to make ceremonies and customs conform to inner-plane weather mapped by astrological positions. 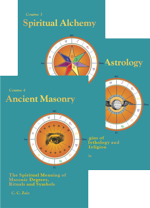 In Course VII, Spiritual Astrology, the spiritual conception and the traditional story illustrating it, are given for each of the 48 ancient constellations. And in the reference book, Star Lore of All Ages, the astrological significance of 30 different holidays is given. These holidays are observed only at the particular time of year when the astrological positions correspond to the significance of the holiday. If the attempt is made to hold them at some other time of year, either the holiday reverts to its original day, or its observance soon ceases. As an example of this, during the period when Franklin Delano Roosevelt was president of the United States for the third time, influential business men presented the idea to him that the two holidays, Thanksgiving and Christmas, were too close together. They held, and most business men concurred, that there would be more sales if Thanksgiving were held earlier in the autumn, so that people could recoup financially from the spending at this holiday before the time to spend Christmas money. It was a period when increasing business was a main objective of the government, and Roosevelt announced that henceforth Thanksgiving would be held earlier. And for a year or two he made the presidential announcement of the day on which Thanksgiving was to be celebrated earlier in the month of November. But even though Thanksgiving is established each year by presidential announcement, and the President proclaimed the day on which it was to be held several weeks earlier, the attempt to hold the festival on an inappropriate astrological day—for the Sun was then in Scorpio instead of the Jupiter thanksgiving sign Sagittarius—failed. In some states two Thanksgivings were held, one on the day proclaimed by the President, and one on the accustomed day which was thus designated by the Governor of the state. In other states people were indifferent to a Thanksgiving which they felt somehow was not right. To be normal, as explained in Astrological Lore of All Ages, Thanksgiving must take place during the time the Sun is in the Sagittarius decanate of the sign of religion, Sagittarius, the decanate the key word of which is Devotion. Prayer is an essential part of the Thanksgiving ceremony, as is Jupiter abundance. Therefore, in spite of the merchants, supported by the President of the U.S., the people drifted back to the appropriate astrological day. To determine the influence of the inner-plane weather on the outer-plane weather there is no birth chart of weather as a whole that can be ascertained, for the weather has been in existence as long as there has been a planet earth. However, there are definite periods during which the weather normally functions. The three significant factors of the weather are the temperature, the air movement, and the precipitation of moisture. Therefore, what we need is the birth chart of each period affecting the temperature, the birth chart of each period affecting the movement of the air, and the birth chart of each period affecting the precipitation of moisture. And as in natal astrology, horary astrology, mundane astrology and stellar diagnosis, we also need to know the method of progressions which indicate when the weather changes indicated by each of these weather charts will take place, and the nature of the indicated change at that particular time. Because the weather is so variable and unstable we should not expect the birth charts of weather periods to be of long duration. We cannot consider that a given weather period has a long span of life compared to the life of man, or even compared with political, financial and such affairs as are considered in mundane astrology. The life of a weather period is of comparatively short duration. In determining the life span of weather periods, as so often happens, tradition came to our rescue. From most ancient times, as symbolized by the four different suits of the tarot, the weather has been divided into four different seasons. We have spring, summer, autumn and winter; each long recognized as a separate, distinct, and well defined weather period. And the checking done by a great many students in various parts of the world in the 16 years since the charts here presented were published has well verified that each of these quadrants of the year is the natural life span of a major weather period. Our first step in weather predicting, therefore, consists in erecting a weather birth chart for the moment the Sun enters each of the movable signs at the place where the weather is to be considered. To make the erection of such charts both easy and accurate The American Ephemeris and Nautical Almanac issued annually by the Government Printing Office a year in advance, under the heading, Phenomena, gives the Greenwich Civil Time when the Sun enters Aries, Cancer, Libra and Capricorn. And in the back of other ephemerides issued annually this data is given as Greenwich A.M. or P.M. time. If the place where the weather is to be considered is west of Greenwich, subtract the number of hours, minutes and seconds the place is west of Greenwich from the Greenwich time to find the Local Mean Time at that place. If the place is east of Greenwich add the number of hours, minutes and seconds the place is east of Greenwich to the Greenwich time to find the Local Mean Time at that place. The number of hours, minutes and seconds a place is from Greenwich may be found by multiplying the distance in °s of longitude by four and calling the product minutes of time, and multiplying the remaining ′s of longitude by four and calling the product seconds of time, then converting into hours, minutes and seconds of time. Thus adding or subtracting the difference in time to or from the Greenwich time to get the Local Mean Time must be done for all weather charts after the Greenwich time has been ascertained; for all weather charts must be erected for the Local Mean Time of the place for which the weather is to be ascertained. I think, either from astrologers or physicists, there would arise no dispute over the statement that the Sun is the heavenly body which chiefly influences the temperature on the face of the earth. I suppose, also, it would quite as readily be admitted that variations in temperature are the most important cause of weather changes. Wind, for instance, chiefly results because of the difference in temperature between adjacent regions which causes warm air to rise and cold air to flow in to take its place. That is, differences in atmospheric pressure, and the air movements consequently, arise chiefly from variations in temperature. Temperature also determines in great degree the amount of moisture the air can absorb, and whether or not moisture held in the air will be precipitated. Warm air can hold much moisture before the saturation point is reached. When the saturation point is reached, however, any lowering of the temperature will cause precipitation, because cold air cannot hold so much moisture. These are very elementary principles relating to weather variations. But a more technical discussion would not be appropriate to our purpose, which is to afford a decidedly popular, and so far as possible non-technical, method of astrological weather forecasting. Consequently, I shall avoid references to areas of high barometric pressure and areas of low barometric pressure. These highs and lows do influence wind currents and the precipitation of rain and snow and the formation of storms. But they are chiefly due to temperature changes. After all, what the ordinary individual wishes to know about the weather is not whether the barometer shows him to be in a high or low pressure area. He wants to know if the weather is going to be cool, warm, hot, or cold; he wants to know if it is going to be windy or calm, stormy or pleasant; he wants to know if it is going to be cloudy, if the sun will shine, or if it will rain. That is, his chief concern is in temperature, in air movement, and in moisture precipitation. These things he wants to know in advance, because extreme weather conditions of any kind may cause him financial loss, discomfort, or even loss of life, if he is unwarned of their approach and consequently unable to take proper precautionary actions to meet them. The Sun, chief ruler of temperature, changes polarity four times a year in its influence on the weather. When it enters the sign Aries at the commencement of spring the hours of daylight become longer than the hours of darkness. From this time on until the Sun enters the sign Cancer, the days continue to get longer; but so soon as the Sun crosses the solstice into Cancer at the commencement of summer the days start to shorten. Then when the Sun crosses the equinox into Libra at the commencement of autumn the nights become longer than the days, again changing polarity as it did when it entered Aries and Cancer. The nights continue to get longer until the Sun moves into Capricorn at the winter solstice and again changes polarity. From that time on until it once more reaches Aries the days get longer until when it enters Aries nights and days are once more of equal duration. The most significant weather charts we call temperature charts. They have to do with the commencement of each new season of the year by the Sun moving into a movable sign. A temperature chart is erected for the moment the Sun enters Aries, Cancer, Libra or Capricorn, as the case may be, using the Local Mean Time of the place where the weather is to be thus foreshown. The temperature chart for the Sun’s entry into Aries lasts until the Sun enters Cancer three months later. The temperature chart for the Sun’s entry into Cancer lasts until the Sun moves into Libra. The temperature chart for the Sun’s entry into Libra lasts until the Sun moves into Capricorn. And the temperature chart for the Sun’s entry into Capricorn lasts until the Sun moves into Aries. Thus we have a distinct temperature chart for each of the four seasons; spring, summer, autumn and winter. Yet temperature is not the only thing of importance in connection with the weather. Next in importance are air movements; because the air movements, largely resulting from temperature changes, are so influential in causing precipitation of moisture. Our next interest, therefore, is with air movement charts. I suppose no astrologer would dispute that the planet Mercury rules the winds. Mercury is pictured as traveling with wings on his feet, and he is as changeable as thought itself. And because, like the wind, he is so changeable, more readily than any other planet taking on the condition of that with which he is temporarily associated, it requires no vast change in his environment to cause him to start a new and distinct period of endeavor. That is, a rather slight change in his environment is enough to give him a distinctly different trend than he had before. The change of influence a planet has when it moves from one sign into another is not a marked change of polarity such as takes place at the commencement of its cyclic journey when it moves from south to north declination; nor is it so pronounced as the change of polarity experienced by the Sun at the commencement of each of the four seasons of the year. Yet much observation and checking indicates that it is quite enough to cause the volatile and fickle Mercury to take on new and distinctive characteristics in its influence on movements of the air. Every planet has a different resonance in each of the different signs; and the air is so susceptible of being influenced by slight changes, and Mercury so readily changes to the quality of the sign into which it moves, that this entering a new sign of the zodiac is sufficient change of polarity to warrant the erection of a new air movement chart. The air movement chart erected for the moment Mercury enters a new sign of the zodiac at the place for which it is desired to forecast air movements is not of regular duration; for it lasts only until Mercury enters some other zodiacal sign. It may last merely a matter of eighteen days, for instance, or on another occasion it may last more than sixty days, depending on how quickly Mercury moves through the sign it enters. In other words, it is as variable as the winds of heaven. Its influence always terminates, however, when Mercury leaves the sign which it entered at the time the chart was erected. We still have to consider the element of moisture. And I feel confident that any astrologer will agree with me that the Moon rules moisture. It is the traditional ruler of liquids of all kinds. Yet because the precipitation of moisture, such as fog, rain, snow and hail is so dependent upon temperature changes, the moisture charts must always be considered subsidiary and subservient to the temperature chart operative at the same time. Moisture charts, as indicated, are dependent upon the changes in polarity of the Moon. And because weather is so variable a condition, it is not merely the cyclic chart commencing at New Moon which has its outer-plane weather parallels, but also the charts erected for the other phases of the Moon. Just as tradition points to their being four seasons of the year, each denoting a distinct weather period, so tradition also points out that there are four distinctive periods of the lunar month. Calendars, almanacs, and other astronomical guides at the present day, as throughout the past, take pains to note the days on which the Moon enters each of its quarters. Even as the Sun, the major weather influence, in its movement around the zodiac sets off four distinctive periods, so also the Moon in its movement around the zodiac sets off four distinctive periods. The New Moon starts the first period, which lasts until the Moon makes the square aspect to the Sun; and this period, because it is one-fourth of the travel of the Moon from one conjunction with the Sun to the next conjunction with the Sun is traditionally called the First Quarter. The second period lasts from the first quarter, which ends when the Moon is square the Sun, to Full Moon, when the Moon makes the opposition to the Sun. This opposition ends the Second Quarter. The third period lasts from Full Moon, when the Moon is opposition Sun, until the Moon once again makes the square aspect to the Sun. The Third Quarter ends when this square aspect is made. The fourth period, commencing when the Third Quarter ends, lasts until the Moon once more makes the conjunction of the Sun, which marks New Moon. From New Moon, when the Moon is conjunction the Sun, until Full Moon, when the Moon is opposition the Sun, the Moon increases in light. From Full Moon, when the Moon is opposition the Sun, until New Moon, when the Moon is conjunction the Sun, the Moon is decreasing in light. The fourth period ending at New Moon completes the circle. For moisture charts we erect a chart for the exact moment of Local Mean Time at the place where it is desired to forecast the weather that the Moon makes the conjunction with the Sun, that the Moon makes the first square aspect to the Sun, that the Moon makes the opposition to the Sun, and that the Moon makes the last square aspect to the Sun. We thus, following this plan, have a new moisture chart for each seven day period. Fortunately for ease and accuracy in calculating these moisture charts, The American Ephemeris and Nautical Almanac issued annually by the Government Printing Office a year in advance, under the heading, Phases of the Moon, gives the Greenwich Civil Time for New Moon, for the first square which it calls First Quarter, for Full Moon, and for the last square, which it calls Last Quarter. And most ephemerides which are published annually have an aspectarian in the back which gives, along with the time of other aspects, the time when the Moon makes the conjunction with the Sun, the first square aspect with the Sun, the opposition with the Sun, and the last square with the Sun. As the time given is for Greenwich, the Local Mean Time at the place for which it is desired to forecast the weather must be ascertained by subtracting or adding the difference in time, as explained when considering temperature charts. The chart must be erected by using the Local Mean Time so found, and the latitude of the place for which it is desired the weather should be foreknown. We have now indicated the three types of charts used in weather predicting: a temperature chart based on the position of the Sun, an air movement chart based on the position of Mercury, and a moisture chart based on the position of the Moon. In any of these charts the sign position of the planets, and the aspects made between planets, are identical the world over. Each chart, though erected for a different station in the world, is erected for the same moment of Greenwich time. The sign positions of the planets, and the aspects between the planets for the commencement of any particular weather period are the same throughout the world, and have an influence on the weather, not merely in some one spot, but all over the world. They are world weather influences. But the chart erected at a given spot on the earth’s surface gives its own house positions of the planets and its own rising sign degree. Either a difference in geographical longitude or in geographical latitude will give a variation in house positions and in the degree upon the Ascendant. It is the house positions of the planets that must be given consideration in judging the type of weather that will follow during the weather chart’s period in a given locality. Such weather charts as we have been considering, erected for the same Greenwich time, each governs the general weather for the locality where erected, over a definite period of time. The three charts, in combination with each other, and subject to the normal conditions at that time of year in the given locality for which erected, give an astrological picture of the weather conditions that may be expected during the indicated period. But even as in a human birth chart something more is needed than a map of the general trend of the character, aptitudes and fortune, so also in weather charts something more is needed than maps of the general weather conditions during the week, during the month more or less, and during the three month season. Even as in natal astrology, to time the events shown as probable by the birth chart it is necessary to calculate and judge progressed aspects, so also in weather predicting, to determine when indicated weather changes will occur we must have recourse to progressed aspects. 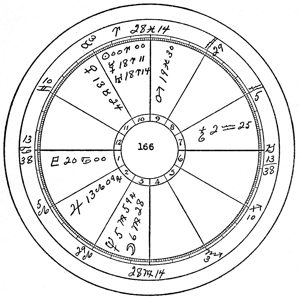 Unlike natal astrology in which major progressed aspects are most significant, and unlike mundane cycles in which the transit progression of only the planet for which the chart was erected is found significant, in weather predicting the transit progressed aspects—as shown by the positions of the planets in the ephemeris on the calendar date under consideration—of all the planets are significant. Their aspects formed in the sky have significance over world weather conditions in general; but it has been found that for a given locality only the aspects of the planets to the Ascendant of a weather chart is indicative of a weather change. The transit progressed aspects to the Ascendant, which to be effective must be within the customary one degree of perfect, of the chart are only of local significance and serve as pointers indicating the time when weather changes affecting the specific locality will take place. These aspects to the Ascendant cannot cause weather conditions not indicated by the chart; no more than in natal astrology a progressed aspect can indicate an event which the birth chart does not indicate as probable. But they do indicate when such changes as are shown by the chart will transpire. The correct reading of these transit progressed aspects to the Ascendant is the most difficult factor with which we have to deal in weather predicting, because of the tendency to attribute an influence to an aspect made to the Ascendant which the weather birth chart as a whole does not substantiate. Their correct reading requires both experience and much refinement of judgment. In all three types of weather charts the method employed is the same. It consists of considering the °s and ′s on the Ascendant of the chart as the polarizing point for atmospheric conditions for the given locality. Every aspect formed, therefore, by the movements of the planets as shown daily in the ephemeris, not neglecting parallel aspects, to the degree on the Ascendant, indicates some weather variation. The kind of variation depends upon whether the aspect is to the Ascendant of the temperature chart, to the Ascendant of the air movement chart, or to the Ascendant of the moisture chart, upon the nature of the planet making the aspect, and upon the general weather indications of the chart as a whole. If it is the temperature chart which is being considered, it is to be considered the most important chart of all, not merely in regard to temperature, but also in regard to indicating the general conditions of the weather for the three month period that it covers; because temperature is so important in influencing both rain and wind. Thus the chart erected for the time the Sun enters each movable sign is to be taken as the general indicator of what may be expected during the season. But when such wind, and such rain as is indicated will occur is not to be determined from the temperature chart, but solely from the air movement chart and the moisture chart respectively. The time, however, when temperature changes will occur is to be ascertained solely from the temperature chart. Inspection of the ephemeris will indicate the daily positions of the planets, and reveal those days when any planet makes an aspect to the ° and ′ on the Ascendant of the temperature chart. Every such aspect indicates some variation of temperature, having an influence over the period during which the aspect is within the customary effective one degree of perfect. The heavier aspects, such as conjunction, opposition, parallel, square and trine, indicate more pronounced temperature fluctuations than do sextiles, semisquares, sesquisquares, inconjunctions and semisextiles. Because they move so slowly and the influence is effective during the time the aspect is within the effective one degree of perfect, the aspects of Pluto, Neptune, Uranus, Saturn and Jupiter indicate longer periods of influence, in which the drop or rise on the exact day the aspect is perfect may not be so pronounced. The Sun and Mars in their aspects to the Ascendant are more precise in influence, and have stronger effects than Venus and Mercury. The aspects made to the Ascendant by the Moon last so short a time that, except when made in the moisture charts, their influence is not pronounced. The air movement chart determines the wind during the period it covers, subject, of course, to the chart of the season. An air movement chart showing much wind may not indicate wind storms, but only that it will be a windy time in comparison with the balance of the season. And the time when wind may be expected is determined by the aspects, as they are made, of the planets to the Ascendant of the air movement chart. A moisture chart lasts only a little over seven days. It indicates how much precipitation there will be during the seven days covered, in comparison with other seven day periods during the season. When such moisture as is indicated will fall is shown by the aspects of the planets, as revealed by their positions in the ephemeris for the current year, to the Ascendant of the moisture chart. Even though the aspects formed by the Moon last but a few hours, because the Moon rules these moisture charts, even those days when the Moon makes heavy aspects to the Ascendant of a moisture chart may be important. On the average, in natal astrology, in horary astrology, in stellar diagnosis, and in mundane astrology, it is found that the outer-plane environment and the inner-plane environment have about an equal amount of influence over conditions and what happens. And this principle is equally valid in weather predicting. Inner-plane weather has a profound influence over outer-plane weather. But the resistance of a particular environment to inner-plane weather of a certain kind must always be taken into consideration. That is a difficult factor successfully to handle in astrological weather predicting. Each locality on the earth, due to many variable factors, has its own particular weather conditions which vary with the seasons of the year. Just as in the other mentioned branches of astrology, we have a norm that always must be considered. Variations of the inner-plane weather mapped by astrology do not during the ordinary life time of man radically change the weather of a certain area. It only indicates variations from the normal weather at a certain place during a certain period. Therefore, before an individual can successfully predict what the weather will be during a given period at a certain place, he must become familiar with the normal weather conditions at that place during that time of year. With this information, the aspects made to the Ascendants of the weather charts will indicate when the variations from this normal, as shown by the weather charts, will take place. In the Death Valley region of the United States, for instance, the average precipitation is but a few inches, and these few inches commonly fall during the winter. The exception to this is that during the hotter period of the year a cloudburst may occur in the neighboring mountains and a vast amount of water, precipitated in a small area, may rush down some canyon carrying boulders, sand and gravel out upon the valley floor. In addition to this lack of moisture, during the summer there frequently are periods when for days hot, dust laden winds blow violently along this baked depression in the surface of the earth. It will be seen, therefore, that the astrological conditions which would indicate wet weather in Death Valley, even in winter, would be unusually pronounced, but that the astrological conditions indicating violent winds in summer would be exceedingly slight. It requires very wet aspects forming to the degree on the Ascendant of the moisture chart to give rain, even in winter; and no matter how wet the chart, or how wet the planet making an exact and powerful aspect to the degree on the Ascendant, it would be hazardous to predict wet weather on the floor of the valley in summer. But in the same state of California, in Humboldt County on the coast, a day in winter when it does not rain is a decided rarity. It is normal for it to rain nearly every day in winter. A wet moisture chart, and aspects from wet planets to the degree on the Ascendant, would indicate not merely rain in this region, but more rain than usual. No matter what the weather charts, nor how the Ascendants were aspected, you should not expect a tornado in California. And even in the northern part of the U. S. it would be unwise to predict, no matter at the weather charts might show, there would be a tornado in January. Before there can be success in using astrological methods in weather predicting there must be thorough familiarity with the weather conditions that normally occur in the particular region. And it must be taken into account what kind of weather may be expected in this region normally at the particular time of year for which the weather charts are erected. Having made himself thoroughly familiar with the normal weather, the student of astrological weather predicting will be in a position to judge, and with practice quite precisely, how the weather in the vicinity will be affected by unusual conditions shown in the weather charts. Certain signs are dry and other signs are wet. Certain planets are dry, and certain planets are wet. When wet influences occur in the season temperature chart or the moisture chart in those positions that have an influence over the weather, he may know that weather which is wetter than the normal for the season is at hand. Certain signs and certain planets are hot, and other signs and other planets are cold. When hot planets and hot signs are in the positions in the temperature chart for the season that affect the weather, he knows it is going to be a season hotter than normal. Certain signs and certain planets are windy, and other signs and other planets are calm. When in the temperature chart and the air movement chart the windy signs and planets are in those positions affecting the weather in his vicinity, he knows that a windy period is at hand. Certain planets are violent, and certain aspects are violent. And when there are violent planets making violent aspects to each other in the sky there is always violent weather on the earth, of a nature corresponding to the planets and their aspects. And if such violent planets occur prominently in the weather charts erected for a certain vicinity, he knows that violent weather there may be expected. If the chief afflicting planet is Saturn, it may be a freeze, a flood, a blizzard, or a drought; but it will be destructive. If Uranus is the chief afflicting planet, electrical disturbances, or at least some sudden violence may be expected. If Neptune is the chief afflicting planet, the weather will be quite out of the ordinary. Thus each planet has its own significance where weather is concerned. And if a storm is indicated, it will break when there is a characteristic aspect to the Ascendant of the weather chart. Saturn in fourth. Violent Uranus ruling cusp of fourth in T-square with Moon and Pluto. Pluto and Mars ruling first, Mars conjunction violent Neptune. Sun conjunction windy Mercury. All three planets in angles are violent. April 4, 1933, U. S. Dirigible Akron, the world’s mightiest airship, was caught in twisting center of thunderstorm at indicated location, was torn apart with loss of five million dollars and 73 lives. 1:37 A.M. LMT; 118:15W. 34N. Ruler of fourth is cold Mercury in warm Sagittarius. Cool Pisces on Asc. and cold Uranus in first. Cold Saturn rules sign occupied by Sun. Hot Mars and warm Sun in angles are offset by cold Uranus and cold Mercury in angles. 12:01 P.M. LMT; 118:15W. 34N. Mercury, chief ruler of fourth in hot Aries indicates some hot periods. Venus, co-ruler of fourth, is in moderate Taurus. Virgo on cusp of fourth is cold, and Libra in fourth is cool. Mercury conjunction Uranus indicates cold periods. Asc., Cancer and Pluto in first give no heat. Climatological Data reveals that both April and May were cooler than normal, but that June was slightly above normal.